Mildred left an East Coast finishing school and went west to join the 101 Ranch Wild West show, beginning a colorful career that included winning the World Champion Girl Bronc Rider title twice and acting in silent movies with Tom Mix. A versatile performer, Mildred was skilled in trick riding, trick shooting and training performing animals. 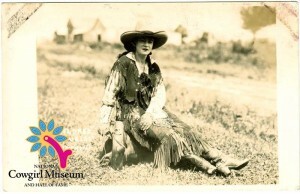 After retiring, Mildred became a nurse and eventually opened her own museum dedicated to her cowgirl life.